For fans of Liane Moriarty, this riveting novel of domestic suspense brilliantly uncovers the fault lines that lurk beneath the façade of a perfect marriage over the course of an explosive twenty-four hours. Paul Strom has the perfect life: a glittering career as an advertising executive, a beautiful wife, two healthy boys and a big house in a wealthy suburb. And he's the perfect husband. That's why he's planned a romantic weekend for his wife, Mia, at their lake house, just the two of them. And he's promised today will be the best day ever. But as Paul and Mia drive toward the countryside, a spike of tension begins to wedge itself between them. How perfect is their marriage, or any marriage, really? Is Paul the person he seems to be? And what are his secret plans for their romantic weekend? Best Day Ever crackles with dark energy, spinning ever tighter toward its shocking conclusion. In the bestselling, page-turning vein of The Couple Next Door and The Dinner, Kaira Rouda weaves a gripping, tautly suspenseful tale of deception and betrayal dark enough to destroy a marriage… or a life. Kaira Rouda is the USA Today bestselling author of novels including Here, Home, Hope, The Goodbye Year, In the Mirror and All the Difference. Her stories explore what goes on behind closed doors of seemingly perfect lives. She lives in Southern California. Question: What inspired the story of Best Day Ever? Kaira Rouda: The narrator of Best Day Ever, Paul Strom, popped into my head one day almost fully formed. He demanded to tell his story - and I obliged. If you've read Best Day Ever, you'll know Paul is quite persuasive. I've never had a story write itself more quickly. As for who Paul's character could have been inspired by, I like to note that we've all met people like Paul in our lives, unfortunately. Whether a particularly bad boss, or a rude person at the store, we have encountered them. The secret to happiness is to never fall in love with one of these people. Question: Did real life experiences contribute to Best Day Ever? Kaira Rouda: If you mean real life experiences of having a lake house we drove to on summer weekends when the kids were little, then yes. There is a magical place called Lakeside, Ohio, on the shore of Lake Erie in Ohio. While the setting is real, I never vacationed there with anyone like Paul. The other simmering theme beneath the story of Best Day Ever is the notion that many people wear the facade of a perfect marriage. There is no such thing. I'm intrigued by what goes on behind closed doors of seemingly perfect lives. Mia and Paul Strom, their perfect suburban setting, is a chilling example of that theme. 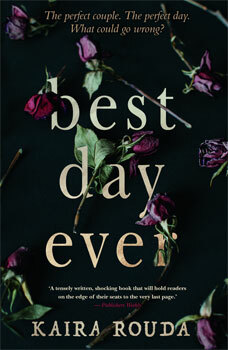 Question: What did you enjoy most about writing Best Day Ever? Kaira Rouda: I had a blast writing a very unreliable narrator. And, as I mentioned, even though it may seem a little crazy, Paul told his own story to me, bit by bit. The fun and the challenge of writing these types of suspense stories is in the layers, leaving a trail of clues that aren't too obvious, to keep readers guessing but not too much. I enjoyed every moment of writing Best Day Ever. Even the title popped into my head from the beginning. I'm thrilled other people are enjoying it, too. Question: How does it feel to be compared to Liane Moriarty? Kaira Rouda: If that's happening, it's the biggest compliment I could receive. Liane Moriarty is one of my favorite authors. Her stories are brilliant, and heartfelt, creepy and enlightening. She writes about the same themes and utilizes similar settings, albeit in Australia versus the United States. It's the highest honor to be compared to her, truly. Kaira Rouda: Enjoying this moment. This is my first traditionally published novel, and it has all been something of a dream. Just the fact my book is being read in Australia right now - a place I've never visited but have always dreamed about - is surreal. And of course I'm at work on my next novel, in the same psychological suspense realm, scheduled to come out next year. I feel like I've hit my stride as an author, found my voice. At least I hope so.